The Porchlight Players are presenting "Spamalot," a musical version of "Monty Python's Quest for the Holy Grail." The performances are all sold out. The Porchlight Players’ dinner theater production of “Spamalot,” at Eagle’s Brush Creek Pavilion, is sold out. But if you feel like begging and whining, go to porchlightplayers.com. EAGLE — The Porchlight Players have found their Holy Grail. 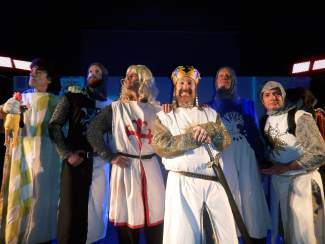 For the humor-impaired, “Spamalot” retells the legend of King Arthur and his Knights of the Round Table. It features a bevy of beautiful showgirls, flying cows, killer rabbits and the taunting Frenchman. Porchlight veteran Ann Olin directs the troupe’s first foray into scenic theater. They chose “Spamalot” from a stack of 15 or 20 show options in a shorter expanse of time than anything this side of a theoretical physics experiment. The entire run is already sold out, although lots and lots of Porchlight and Python fans have been whining and wheedling and begging for the Porchlight Players to add another performance or two. “That would be a ‘no,’” Olin said. 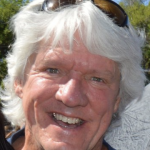 Paul Witt is Patsy, King Arthur’s horse and servant. He’s the guy who follows King Arthur around banging together coconuts, making clopping noises. Witt answers the questions so many have asked: “Yes, they’re really coconuts, and yes, they really make that sound,” he said, clomping them together to make the effect. About half of the 17-member cast is new to Porchlight Players, including Jamie Harrison. He’s Sir Bedevere the Flatulent. It is not type casting. “I tried out and landed the part,” Harrison said smiling. “It’s just like Lana Turner’s story” Witt interjected. Bart Garton is back, this time as Sir Galahad. “I start out getting the girl, then everyone gets the girl,” Garton said. The costumes are from a professional theater house, and look that good, except for the Black Knight costume they sent. It was pretty much awful. So Ann Olin, whose brain doesn’t have an off-switch anyway, woke up one morning at 5 a.m. Moments later, she was sitting in front of her computer, looking at Black Knight costumes, and decided she could make a better one. So she did. Rodney Johnson is positively resplendent in it (Sir Rodney the Resplendent?). The 2005 Broadway production won three Tony Awards, including “Best Musical,” and received 14 Tony Award nominations. During its initial run of more than 1,500 performances in 2005, “Spamalot” was seen by more than 2 million people and grossed more than $175 million.